A bunch of shipping containers mark the spot where I hope you’ve already been. Whether it was for some early morning Tai Chi or a midnight film fest, Pllek is one of those places that should be high on your list of favourite hangouts in Amsterdam. Nestled into a corner of the industrial NDSM Wharf, owner Sjoerd definitely chose the right spot to set up shop. A new cultural playground for music, theatre, workshops and more. Everything they do here, they strive to do it differently. The entire terrain is built up out of raw, leftover materials, working together and being combined in innovative ways. For the coming seven years Pllek will be ever-expanding; placing a new container on top of the other for an extra floor, building a roof to cover the dining area before winter kicks in and right now the final touches are being made to a new cultural playground for music, theatre, workshops and more. Rawness is also found in their mouthwatering menu. A strong attention for detail towards organic, vegetarian and raw food, all revolving with the seasons. 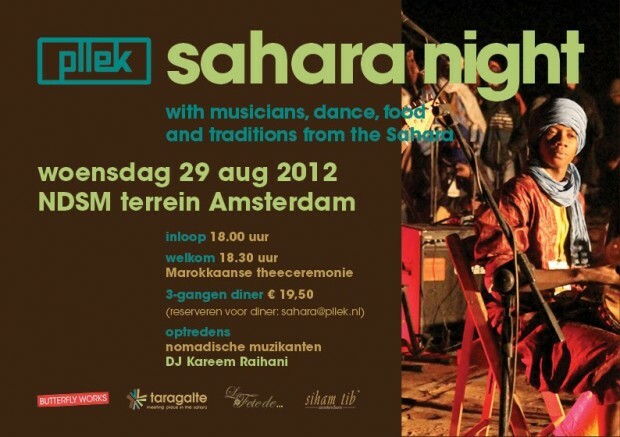 This Wednesday they’ve organized a little nomadic get-together: Sahara Night. The night is decked out with musicians, dance and a Moroccan tea ceremony. To top it all off you can book a place at one of the long tables for a fitting three-course meal (for reservations send an e-mail to: sahara@pllek.nl). Newsflash: Keep your eyes peeled for some close collaboration coming up!